When David’s father is killed by an Epic, he spends the next 10 years studying Epics obsessively. Each Epic has their own fatal flaw, which they desperately try to hide, but David’s meticulous research allows him to destroy them (with a little help from a group of rebel assassins). 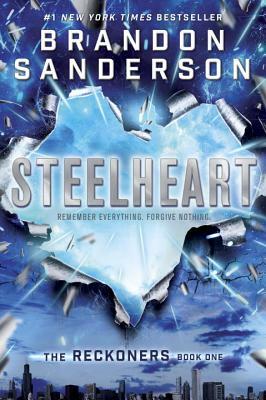 Steelheart is geared toward a Young Adult audience, but fangirls and fanboys of all ages will love David’s focus. Sanderson's re-imagining of the superhero genre is dark and unique. I love the premise that supers are not mankind's saviors but the destruction of society as we know it. Steelheart is a fast-paced adventure that readers won’t be able to put down until they have read the very last page. I cannot wait to see what is next for this series.